Yesterday’s post on the economics spring clearly struck a nerve, getting by far the most hits i’ve had for a single blog entry. 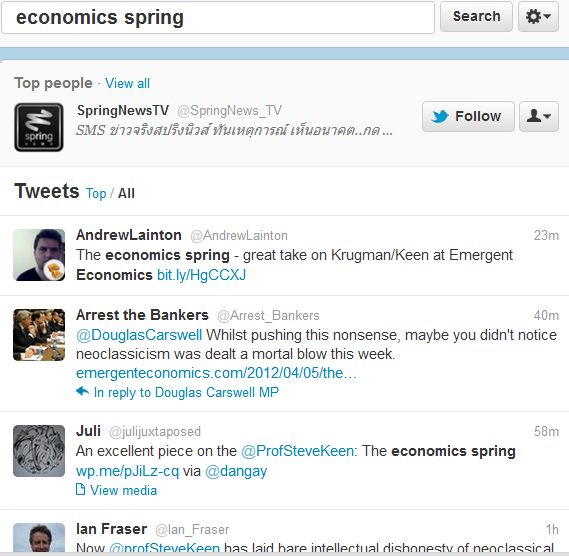 Try searching for ‘economics spring’ on Twitter. OK, it’s not trending like Beiber, but an arcane debate about seemingly obscure matters has simply swished around the Interweb. Is it just lucky that Keen decided to lay into Krugman in early April — printemps dans l’hémisphère nord? Or are some deeper forces at work? Andrew Lainton says that ‘this week will be remembered as the end of the beginning of the end of neo-classical economics’. 3Spoken reckons it’s like the famous Cambridge capital controversies of the 1970s. Then, my external PhD examiner Geoff Harcourt and others battled the neoclassical mainstream on the definition of capital. Despite having the utmost respect for Geoff i’m not so sure the analogy is correct because Krugman hasn’t tackled Keen with any rigour, and anyway, the capital controversies were mostly swept under the neoclassical rug until now. That said, Keen is breaking new ground. To reiterate a point by Keen, it’s all kicked off because mainstream economists have been exposed to the harsh light of practical reality. Previously, the discipline was so technical and inaccessible that outsiders had no choice but to trust most of its pronouncements. The economies of the rich world were mostly booming, so why question the high priests? But the global economic crisis makes it demonstrably clear that something smells fishy. If most economists got it so violently wrong, maybe the very foundations of their discipline were rotten? A host of interested outsiders who are quite capable of technical argument but maybe not formally trained in economics have suddenly got interested. It reminds me of a related, but distinct argument made by Ha-Joon Chang. Some of the most successful examples of economic development ever have been achieved completely without economists. The technocrats behind South Korea’s economic boom were mostly engineers, not dismal scientists. Singapore‘s first finance minister, Goh Keng Swee, in his book Socialism That Works: The Singapore Way, said that: “The book of rules tells you very little and precedents borrowed from advanced countries have a nasty habit of coming apart in your hands.” As Keen says, maybe economics is too important to be left to the economists. Keen v. Krugman also comes at a time when many people are questioning the power of banks. Despite protestations otherwise, the neoclassical model of banks is ideological. It pretends that financial institutions just take a cut from transactions between lenders and borrowers, a bit like Ebay charges a small percentage on sales. Keen’s view says otherwise. Banks aren’t like Ebay; they’re more like a sausage factory. They actually make money (in more ways than one) so they’re immensely powerful and rich. As I said in a post last year, bankers ditched their bowler hats and bought Ferraris, an outcome which has been immensely damaging to society. And to the extent that they do handle flows of cash, they’re a bit like the butcher who takes a prime cut home at the end of the day. They know how it’s made, they traffic loads of it and they take a large chunk home, thank you very much. Anyway, enough of the dodgy analogies. It’ll be interesting to see if spring has really sprung, and if so what form the new economics takes. I strongly suspect that it’ll feature lots more inter-disciplinary work; that it’ll involve more than just academics; and that the old paper journals will look increasingly irrelevant. No, I hadn’t seen that. Thanks. Quite insightful. To most people it sounds a bit weird if you say that banks create money out of thin air, and clearly banks are subject to costs, just like other companies. I agree with your final statement: “Banks are firms whose product is money – they follow the same rules as any other firm – firms produce physical goods, banks and other financial intermediaries produce money.” Funny how we wrote virtually the same thing at the same time. Sometimes you have to wonder whether you’re quite the free agent that you think you are! I quite like the approach of actually listening to practitioners, as opposed to the normal mainstream approach of constructing a model that approximates what you imagine to be how finance works, then making all sorts of policy prescriptions on the basis of your suppositions — which might or might not be true. In my view economics in general could do with a large dose of empiricism, and not just of the complicated, aggregationist econometric sort; but actually asking people how things work in the real world. Dan you are correct in regards to your statement about more technically minded people becoming interested in economics following the various debt crises. Perhaps disinterested during the boom times any engineer worth their title should be interested in how the economic system has collapsed given the grave implications it has for societies, development (from any point) and if nothing else their projects and job. I am a professional systems engineer in manufacturing, mechanical and energy systems and I was astounded when, upon researching house prices in a Australia, I became aware of what appeared to be a clear structural sysemic failure in modern economics via Prof. Keens work and others. I was absolutely shocked to realise the absurdly simple modelling techniquies employed in economics – lets just say its good that none of these types of models were employed in a safety critical situation like making a plane fly or a car steer and go over bumps. Having said that I actually believe the consequences are far worse, the implications of this failure of economics are so far reaching it will have ongoing devastating effects if not quickly and adequately remedied. The old guard of Economists, whom have implemented this rubbish have been treated like royalty and likely will not give up their beliefs without a fight. That is, it seems, the underlying problem though, modern economics with a lack of technical rigour seems mostly about ideology and beliefs about how trade of value ‘should’ work. Unfortunately, in many circumstances as outlined by Steve Keen and others there is no evidence to back up their simplistic models, no science (re proof by experimental results) has been done, therefore it seems a significant amount of modern economic theory is no different to a religion. Be aware some are willing to fight to the death to defend their religion. Where death in this instance is virtually the collapse of modern (somewhat) civil society – see the beginings in greece, spain and a small preview in the UK (surely with more to come soon). Those whom are knowledgeable about the problem and decent communicators must NOW start lobbying politicians and govenrments to resolve this. In 10 years time when society has been ravaged by debt burden (re, lots of developing nations) it will simply be to late to say I told you so. Action must come now.